SAVN (owned by Shark Accident Victim Network Inc.) and SharkSchool (owned by Global Green Marine, Inc) are not responsible for the accuracy of any text given herein. 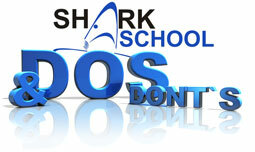 Neither shall SAVN nor SharkSchool be held responsible for any recommendation and suggestion given considering the interaction with shark, or the prevention of incidents. While Shark Accident Victim Network (SAVN) takes reasonable steps to ensure that the information, images, text or links (the Information) contained in this site are accurate and complete, Shark Accident Victim Network (SAVN) makes no representations or warranties as to the completeness or accuracy of the Information. Shark Accident Victim Network (SAVN) hereby disclaims any and all liability for any omissions or errors in or to the Information or the content of this site generally. It is generally illegal to copy, reproduce or distribute copyrighted information or materials (including photographs) without the consent of the owner of such copyright. Generally, the photographer is the owner of the copyright of a photograph or image. Unless otherwise clearly indicated, you should assume that anything and everything you see or read on this site is copyrighted and may not be used or copied by you except as explicitly provided in this site, or by applicable law or otherwise without the express prior written consent of Shark Accident Victim Network (SAVN) or the copyright owner. This prohibition means you may not transmit, mirror, modify or re-distribute any images or text from this site without the express prior written permission of Shark Accident Victim Network (SAVN) or the copyright owner. You may download and print images and text from this site only for your private, non-commercial use. Any other use requires the prior consent of Shark Accident Victim Network (SAVN) or the copyright owner. Any images contained in or displayed by Shark Accident Victim Network (SAVN) on this site, other than as submitted by you, are the property of Shark Accident Victim Network (SAVN) or are used by Shark Accident Victim Network (SAVN) with the consent of the copyright holder and persons if any, appearing in such images. Subject to paragraph 2 here of, the use by you of any such images (or any portions thereof) without the express written consent of Shark Accident Victim Network (SAVN) or the copyright holder is prohibited. UNAUTHORIZED USE MAY BE IN VIOLATION OF THE LAW AND COULD RESULT IN LIABILITY BY YOU. YOUR ACCESSING OR USE OF THIS SITE IS AT YOUR OWN RISK, AND YOU ACKNOWLEDGE AND ACCEPT EVERYTHING ON THIS SITE AS IS, WITHOUT ANY WARRANTIES, EXPRESS OR IMPLIED, INCLUDING WITHOUT LIMITATION THE WARRANTIES OF MERCHANTABILITY AND FITNESS FOR A PARTICULAR PURPOSE. ADDITIONALLY, Shark Accident Victim Network (SAVN) ASSUMES NO LIABILITY AND SHALL NOT BE RESPONSIBLE FOR, AND YOU HEREBY ASSUME ALL RISK OF: INTERRUPTION OF SERVICE, ANY LINKAGE TO ANY THIRD PARTY SITES, ANY COMMUNICATIONS WITH ANY THIRD PARTIES, AND ANY DAMAGE TO YOUR COMPUTER OR OTHER PROPERTY RESULTING FROM YOUR ACCESS TO OR USE OF THIS SITE, INCLUDING BUT NOT LIMITED TO ANY DAMAGE RESULTING FROM ANY COMPUTER VIRUSES OR FROM LINKAGE TO ANY THIRD PARTY SITES. Shark Accident Victim Network (SAVN) SHALL NOT BE RESPONSIBLE FOR ANY DIRECT, INDIRECT, INCIDENTAL, CONSEQUENTIAL, PUNITIVE OR SPECIAL DAMAGES ARISING OUT OF YOUR USE OF OR ACCESS TO THIS SITE. The Information is provided by Shark Accident Victim Network (SAVN) as a convenience and is subject to change without notice. Shark Accident Victim Network (SAVN) may, at any time and from time to time, revise these Terms and Conditions and the content of this site generally with updates and revisions (the Updates and Revisions). You hereby acknowledge and agree that you will be bound by such Update and Revisions regardless of whether or not you have reviewed them. We recommend that you periodically visit this page to review and familiarize yourself with all current Terms and Conditions and review the site generally to familiarize yourself with any Updates and Revisions.